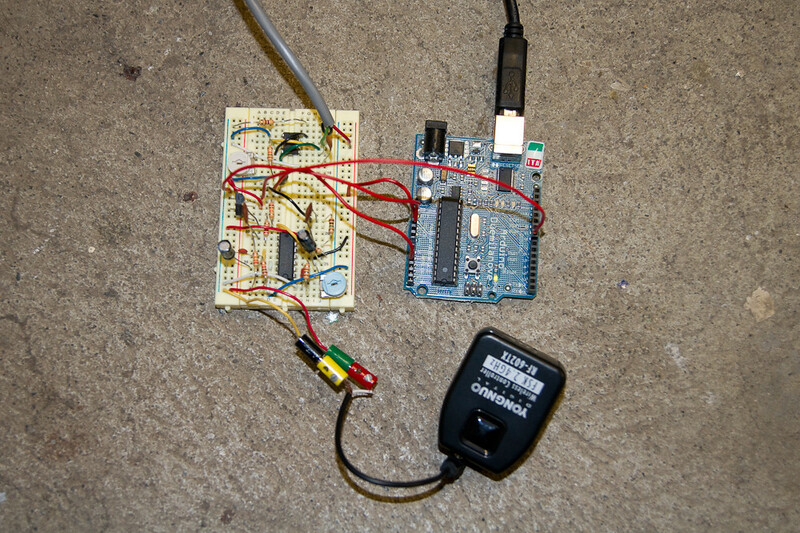 In the last lesson we saw how one can trigger a flash with an Arduino. In this lesson we’ll add a light barrier to trigger the flash in the right moment. One of the biggest difficulties in highspeed photography is to trigger the flash at the right moment. If you try this without additional helpers (try & error), it is possible that you take many photos and still haven’t got the right moment. To trigger the flash in the right moment, we use sensors. Light barriers and sound trigger are often used in highspeed photography. The basic Arduino setup is the same as in lesson 6. We’ll add a light barrier as sensor. I choose the hiviz.com sensor as this is a very cheap assembly kit and it has a very good step-by-step tutorial to build it. We don’t need the delay unit, if we’re using the Arduino. We’ll setup the Arduino to trigger the flash as soon as there is a signal from the light barrier. Mount the light barrier somewhere, where it will get interrupted. If you create “drop images” the drop will interrupt the light barrier. I mounted the light barrier on my ‘sliding table‘ so that it gets interrupted as soon as the slider arrives in its end position. Since I built the ‘sliding talble’ I wanted to take a photo with different colored glasses. 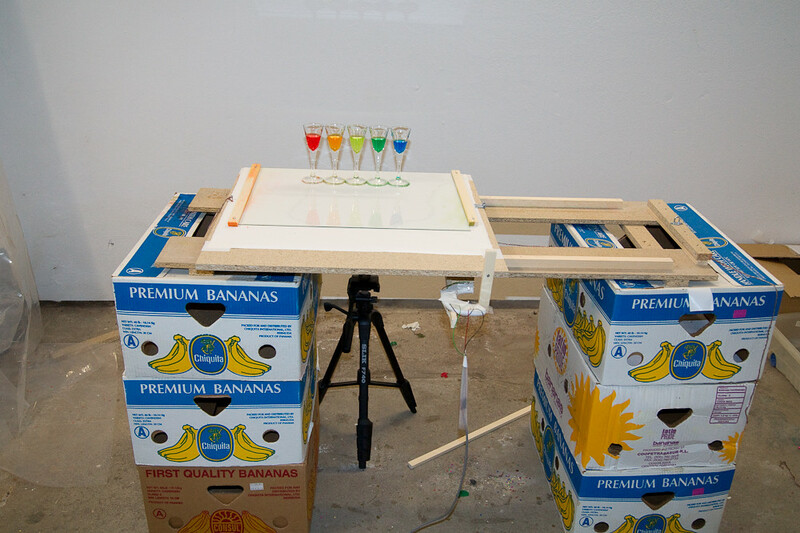 Therefore I modified the slider of my ‘sliding table‘ to hold more glasses. Due to the modifications the slider got a bit massier therefore I accelerated it by hand. I like this example as it shows that there is no big difference between triggering the flash with a sound trigger (last time) and light barrier (this time). Creating the image is fairly easy: Turn of the light, start the camera, accelerate the slider, flash gets triggered, clean up. In this lesson I showed, how we can extend an Arduino with a light barrier. If you react on the signal we get from the light barrier, you’ll trigger the flash in the right moment. First of all grate work and congrats for learning to use an micro controller by your’ self . One thing bugs me about using a light gate and that is why not use a simple switch ? To me it seems more convenient but you may know something I don’t. Nice idea, nice setup, and nice execution!!! I agree one could also use a switch / button but I don’t know where to place the switch so that it will not get damaged from the moving slider. The reason I was using the light gate was that it is contact less. I don’t have to put any electronics on the slider. But as already mentioned, it would also be possible with other triggers. Great tutorial – thanks a lot. One question though – did you notice any additional delay caused by the wireless flash trigger?